During the first day, you visit some of the most famous sites in Wadi Rum by jeep. The second day you hike up Burdah rock bridge during the morning. In the afternoon, you go on a jeep tour to visit some more sites. The last day you hike up Jabal Al-Hash in the morning and in the afternoon you visit a few sites on your way back to Rum village. For the overnight stay, we offer two options. You can choose to stay overnight in our camp, Wadi Rum Base Camp, both nights. Or you can choose for more adventure. In that case, you will sleep outside under the stars in our ‘cave’ the first night, and the second night in our camp. 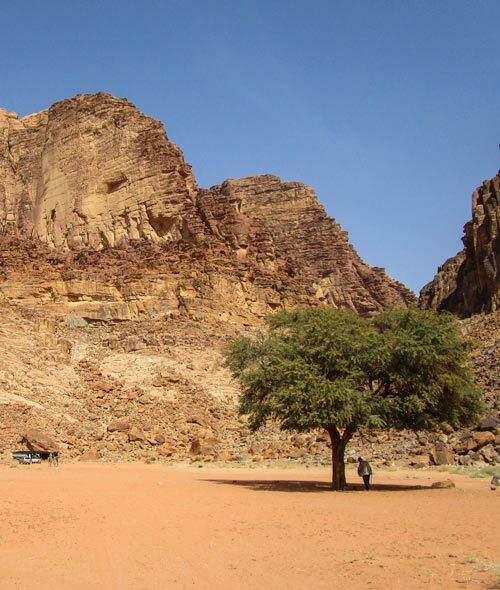 If you want to experience all of what Wadi Rum desert has to offer at a slow pace, this tour is the one for you! Warning: Climbing and scrambling Burdah rock bridge is an adventure for travellers who a physically fit and up for a challenge. And if you are afraid of height, unsure on your feet, this climb is not for you. If this is you, let us know. Then we can suggest an alternative program for you. More information on most of these sites can be found on the Wadi Rum desert sites page. During summer time our tours start at 10 AM. During winter time our tours begin at 9 AM. We meet each other next to the Rest House in Rum village. Here we enjoy a Bedouin tea. We take the time to relax and talk about what we have in mind for today. After finishing our drink, we leave Rum village to go out into the desert. A short ride brings us to the natural spring called Lawrence spring. You scramble the spring to enjoy the spectacular views across Wadi Rum desert. We continue our drive and head to Khazali canyon. Here you see ancient inscriptions and a waterhole. Our next stop is at a red sand dune. You can climb the dune and enjoy running down. A short drive brings us to the big rock wall called Anfishiyyeh. This rock wall is famous for its ancient inscriptions. The last site we visit in the morning is the Lawrence house. We drive to a nice, quiet and shady place where we take a few hours break. We prepare a Bedouin meal for you. After we finish our lunch, there is time to take a rest or walk around to explore the area on your own. In the afternoon we drive to the Mushroom rock. We make a short stop to watch this naturally shaped rock. Then we continue our tour and go to Burrah canyon. Here we take the time to walk through this beautiful canyon. For your overnight stay, you have two options. You can either sleep in our camp, Wadi Rum Base Camp or ‘sleep under the stars’ (bivouac camping). Note that bivouac camping is only available on Monday, Wednesday and Friday. We end our day tour at Wadi Rum Base Camp. Here we serve you a traditional Bedouin dinner. The evening can be spent in the communal area, or, during warm days, outside. We can tell you about Bedouin culture and music, or you can gaze into the starry night sky and enjoy the peaceful silence of the desert. The next morning at 7 AM we serve breakfast. Afterwards, we pack our things and return to Rum village. We arrive here between 8 and 8.30 AM. From here you can continue your journey. Of course, we can help you to arrange transportation to your next destination. We end our day tour at our ‘cave’ to stay overnight. We cook you a traditional Bedouin dinner. The evening can be spent around the fire. We can tell you about Bedouin culture and music, or you can gaze into the starry night sky and enjoy the peaceful silence of the desert. The next morning you can wake up to the rising sun. We prepare your breakfast. Afterwards, we pack our things and return to Rum village. We arrive here between 8 and 8.30 AM. From here you can continue your journey. Of course, we can help you to arrange transportation to your next destination. We drive to the surprisingly green and narrow Abu Khashaba canyon. You walk through the canyon for about half an hour. We wait for you on the other side. We continue our tour and drive to Um Fruth rock bridge. You can climb the bridge and enjoy the views of this part of Wadi Rum desert. Today we watch the sunset at Um Muqur. Today you will stay overnight in our camp, Wadi Rum Base Camp. You can choose to sleep in a tent or outside at a beautiful spot close to our camp. You can wake up to the rising sun. We prepare your breakfast. Afterwards, we break up and drive through the beautiful desert to Jabal Al-Hash. The mountain is close to the border with Saudi Arabia. Climbing Jabal Al-Hash is easy. The views of both the north and the south of Wadi Sabet are beautiful. You can see the difference between the red and the yellow sandstone. This hike also gives you a unique opportunity to discover fossils on top of the mountain. After taking our time to enjoy the views, we head back. We drive to another nice, quiet and shady place where we take a few hours break. We prepare a Bedouin meal for you. After we finish our lunch, there is time to take a rest or walk around to explore the area on your own. In the afternoon we drive to Wadi Nuqra. Here you have the opportunity to walk a stretch through this canyon. Once we are back in the car we drive to one of the famous Bedouin dams. Afterwards, we go and see the rock formation called Cow Rock. Um Ghazah area is inviting you to do some more walking. On our way back to Rum village we pass by Um Sabatah. We arrive in Rum village around 3 PM during wintertime and 5 PM during summertime. From here you can continue your journey. Of course, we can help you to arrange transportation to your next destination. This price includes a Bedouin guide, a jeep, all mentioned meals, drinks and sleeping equipment. Our prices are based on shared touring. Our minimum group size is two persons, and our maximum group size is eight persons. For groups of more than eight persons, we offer private tours without a surcharge being applicable. Departures for one person are available upon request and are subject to a surcharge. We determine your price based on the number of people who are in your booking. If needed, single travellers share tents in our camp. You can share your preference -female tent, male tent or mixed tent- when booking your trip. If you share a tent, a discount is applicable. You can extend this tour with a 1- or 2-hour camel ride at the start or end of this tour. A 1-hour camel ride costs 20 JD per person. A 2-hour camel ride costs 30 JD per person. These prices include a camel guide and one camel per person. You can extend this tour with a pre-night in our camp. This prices include dinner, breakfast, drinks, the overnight stay in our camp and the transfer between our office and our campsite. Children under the age of 3 get 75% discount on the adult price. Children under the age of 6 get 50% discount on the adult price. Children under the age of 12 get 25% discount on the adult price. Prices for private tours are also available on request. We want to make things easy for you. Therefore we created a webpage with information on how to reach and depart Wadi Rum from Amman, Petra, and Aqaba. Further, we offer our guests the service of arranging taxi transfer. Please contact us for the transfer rates. Visiting the desert is a special, and unique experience. Coming prepared ensures a careless time. Therefore made a list of essentials which, according to us, should be included on your packing list. Have a look at our ‘what to bring’ list, for our recommendations. The desert is a harsh place. Endless sunshine, high and low temperatures, wind, blowing dust, we have it all. We can imagine that you wonder what is best to wear in the desert. Therefore we wrote down our ideas for you. Come prepared by reading our webpage ‘what to wear’. The available space for luggage in the jeeps is limited. Therefore make sure to pack all things you need during the tour and overnight stay in a small backpack. Luggage which you don’t need you can store in your car or our office. You can finish payment with us upon arrival. Note that we only accept payment by cash Jordanian Dinars. And please be reminded that Rum village has no ATM and credit card facilities. Make sure to bring money from cities like Aqaba, Petra, Amman or Madaba. Copyright © 2014-2019 | Wadi Rum Nomads | All rights reserved.